Does this mean no strikes before Christmas?Click here to know answer. Rule for providing creche facilities in the Establishments CLICK HERE TO VIEW. NAPE-C& NUGDS Arokonam Joint Divisional conference SGFNPO & Circle secretaries addressed Click here to view. NUGDS,Telangana Circle union Submitted Memorandum to Hon'ble MP Sri.P.Srinivasa Reddy , KhammamClick here to view. No proposal to withdraw cheque book facility in banks: Finance MinistryRead more. Result of Direct Recruitment Examination of PA / SA - 2013 - 2014 announced Click here to view. 7th CPC – Classification of Civil Posts under CCS(CCA) Rules – Gazette Notification Read more. Cabinet approves setting up of the 15th Finance Commission Read more. Page -1 Page -2. Click this link to view. Click the above link to read a letter. PLI Policies: Clarifications Read more. FNPO Comments on IPPB exclusively in c/w GDS Click here to view letter. My Federation comments on IPPB. on 20/11/2017 SG FNPO met the following officers along with General secretary NUR-C Shri N.K Tyagi. Director Mail Management.Click here to read. Regularization of Temporary status casual labourers Click here to read. CGHS and CS(MA) Beneficiaries can go directly at empanelled hospitals on advice of Central/State Govt Specialists - Simplification of procedure for treatment at private hospitals empanelled under CGHS/CS (MA) Rules,1944CLICK HERE TO READ. Brief note on India Post Payments Bank. 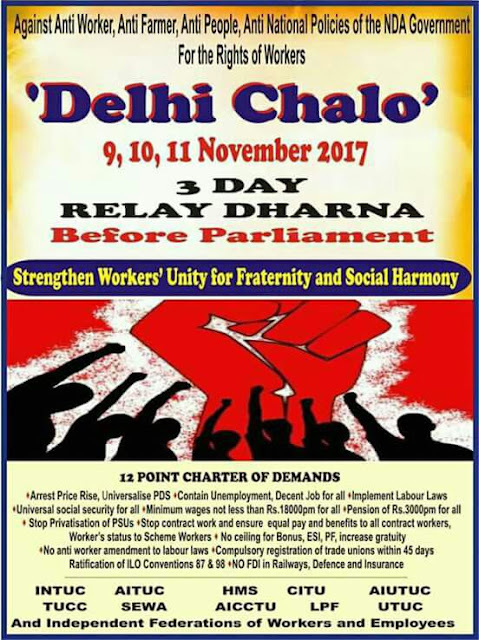 FNPO affiliated unions Circle/Division/Branch secretaries are requested to provide your comments/views if any by 18.11.2017. Letter and a brief note on IPPB. NUGDS General Secretary Sri.P.U.Muraleedharan with FNPO KERALA CIRCLE leaders submitting the memorandum addressed to Hon.Finance Minister through Dr.Shashi Tharoor, Hon.MP Trivandrum. On behalf of MP Shri.M S Jyothish PS to MP accepting the memorandum click here to view. The US Postal Service (USPS) has reported a revenue of $69.6bn for fiscal year 2017, which was down around $1.8bn on last year Read more . Appeal to all FNPO affiliated Union Circle Secretaries. Kindly absorb 48 hours hunger fast from today morning in front of Circle Office/Regional Office, demanding early implementation of GDS committee recommendations. Reservation for SC/ST and OBC in Govt Jobs is not against the Constitution – Creamy layer principle does not apply to SCs/STs says a NCSC study Read more. 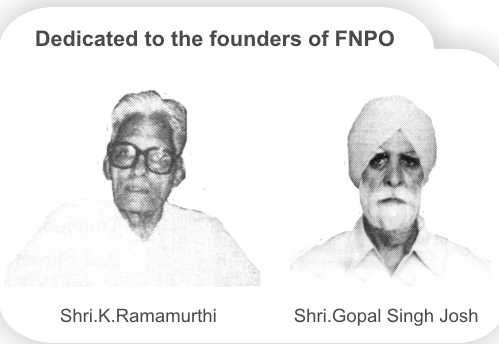 FNPO wishes all success in all their endeavors. Details will be published in the RMSSentinel. IMPLEMENTATION OF THE RECOMMENDATION OF THE SEVENTH CENTRAL PAY COMMISSION – GRANT OF VARIOUS ALLOWANCES OF CENTRAL GOVERNMENT EMPLOYEES. 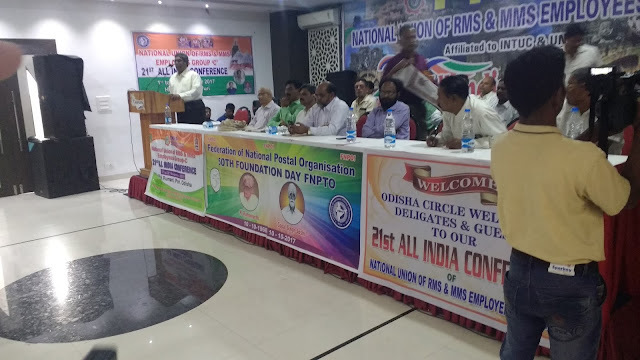 Chief PMG Odisha Circle, BBSR were delivered inspired speeach. Shri D. Theagarajan, SG FNPO reflected in an enthusiastic manner and delivered inspiring speech, particularly to the younger generation of the Department. Our Federation President Shri T.N. Rahate, Shri B. Shivkumar, Asst. Secretary General and affiliated Union General Secretaries Shri. 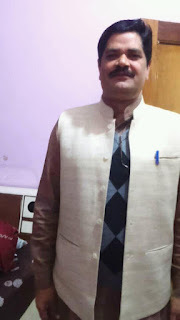 Bhavikar, Shri P.U. Muralidharan and Shri Shivadas greeted the conference. Reception committee, Odisha Circle organised the conference in a spectacular way. Shri Rabindra Patnaik and his team did a wonderful arrangements and their hospitality were astonishing one.